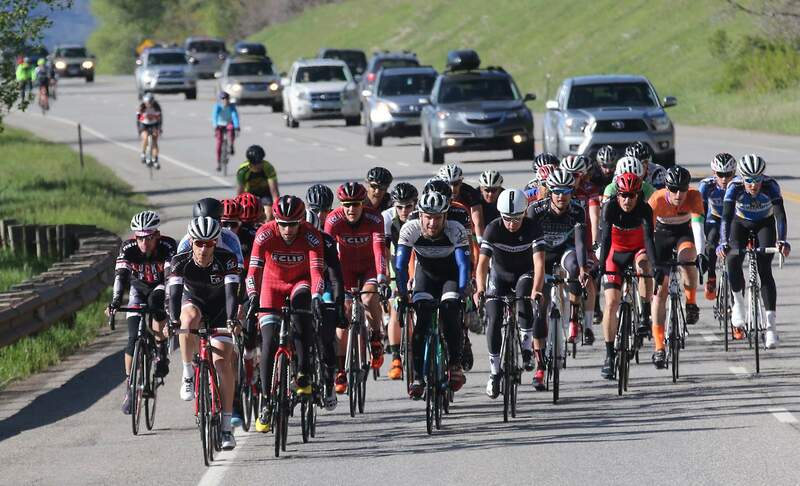 Cycling fans couldn’t have asked for a better lead group at the 45th Iron Horse Bicycle Classic, and they provided a finish that nobody will soon forget. 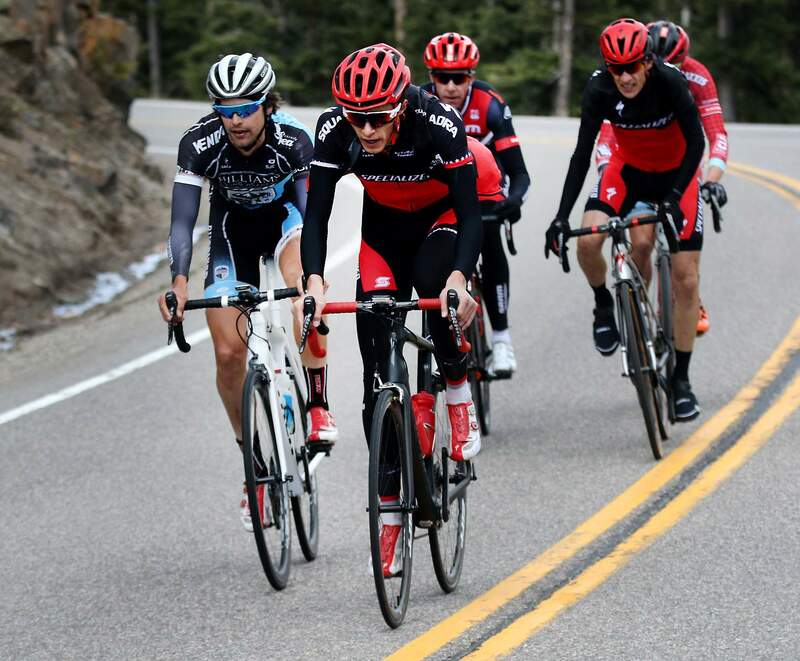 After the 47-mile race from Durango to Silverton, it was Payson McElveen and Benjamin Sonntag first to the finish line at the IHBC Coca-Cola professional men’s road race. It came down to a photo finish, and McElveen barely edged out Sonntag, and Ned Overend finished third. In an epic sprint through downtown Silverton, five men went together and provided an incredible push to the finish line. 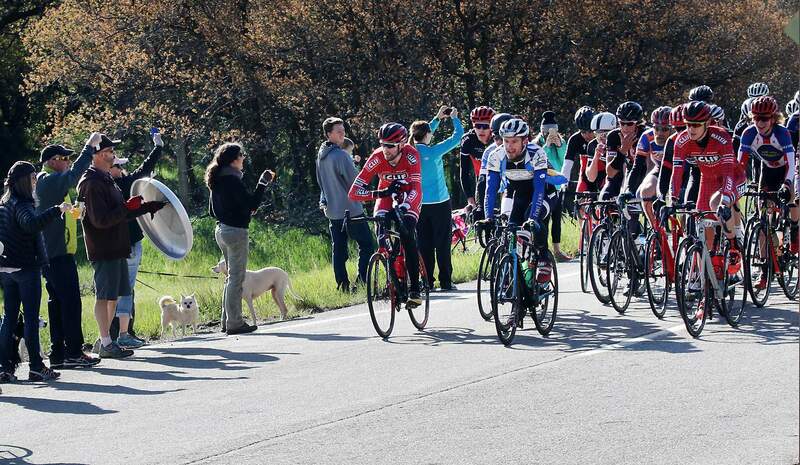 In the last few meters, Todd Wells slipped out of a pedal and Durango’s Christopher Blevins crashed just shy of the finish line before McElveen and Sonntag crossed at nearly the same time. It was McElveen’s first IHBC road race win, and he was certain that he’d placed second until minutes after the frantic finish when they announced that he had actually won. His time of 2 hours, 30 minutes, 7.5 seconds was barely good enough, as Sonntag finished in 2:30:08.0. McElveen is a Fort Lewis graduate. The young rider from Texas won the Squawker Classic road race earlier this year and wrapped up his collegiate cycling career only weeks ago. Sonntag has called Durango home since 2008. 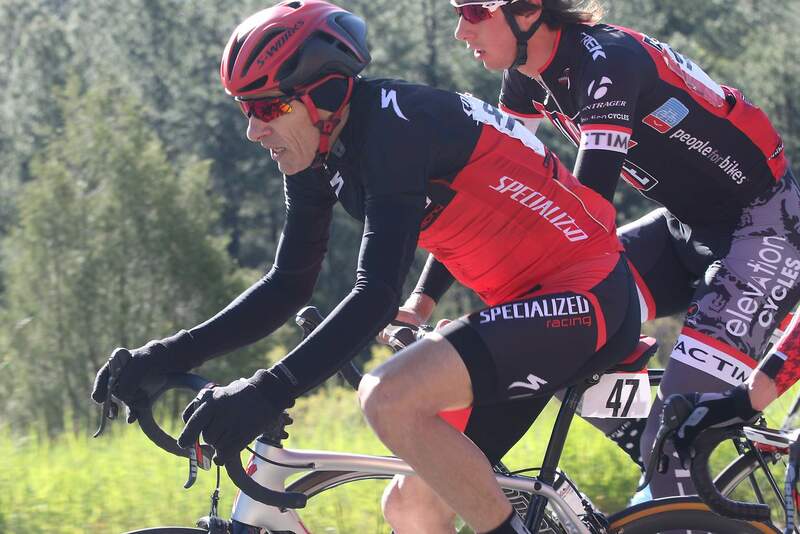 He is a Fort Lewis College alum and is married to Durango road cycling star Carmen Small, who won the USA Cycling Professional Time Trial National Championship race Friday in North Carolina. The couple celebrated their fifth wedding anniversary Friday, making it a weekend the power cycling couple will never forget. Overend crossed the line in third for a second consecutive year. At age 60, he has five IHBC titles, with the last coming in 2011. The lead group let him take the front much of the way, making his trip perhaps the most difficult. The group of five separated themselves shortly before Coal Bank Pass, where Overend was leading for quite a way through the steep inclines. Wells crossed the line in fourth, and brother Troy Wells was behind in sixth. Wells had to slow up at the end to avoid the Blevins crash. Immediately after the group crossed, the attention turned to Blevins, who took awhile to gather himself as blood trickled down his left eyebrow. Just one day before, the teen graduated from Durango High School. That already made for a memorable weekend before he found himself sprinting to the finish among his childhood heroes. Blevins said he will participate in Sunday’s mountain bike race, but Sonntag and Wells are likely to be at the front again. McElveen’s Fort Lewis College teammate Cormac McGeough came in seventh (2:31.17), and fellow Skyhawk Ian McPherson finished 19th (2:36:56). Christopher Brennan came in eighth (2:32:00), Spencer Downing was ninth in 2:33:30 and Chris Carr rounded out the top 10, finishing in 2:33.30. Rolando Gonzalez was 17th with a time of 2:35:13. 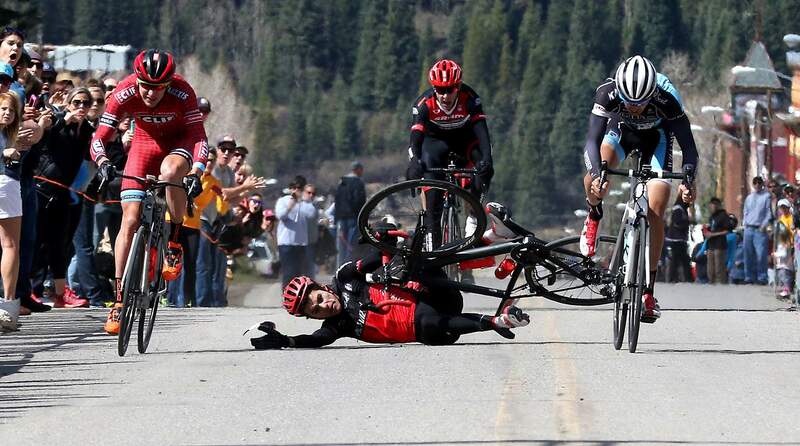 After touching wheels with race winner Payson McElveen, far right, Durango’s Chris Blevins crashed in the middle of the five-man sprint to the finish line in Silverton. It was McElveen and Benjamin Sonntag, far left, coming to the line together for a photo finish, with McElveen narrowly winning. Note: Place and name followed by time and hometown. Full results on 2B. Ned Overend climbs Coal Bank Pass during the 45th Iron Horse Bicycle Classic race on Saturday morning. 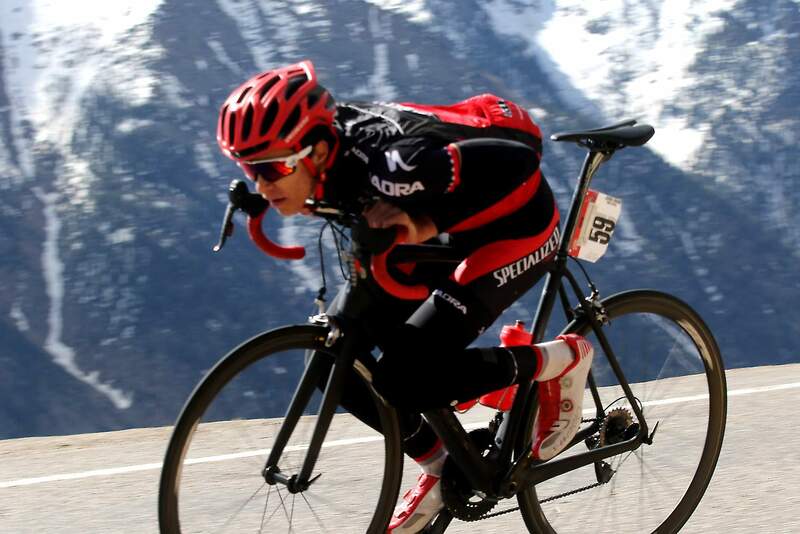 Men’s pro riders begin to climb Molas Pass on Saturday during the Iron Horse Bicycle Classic race. 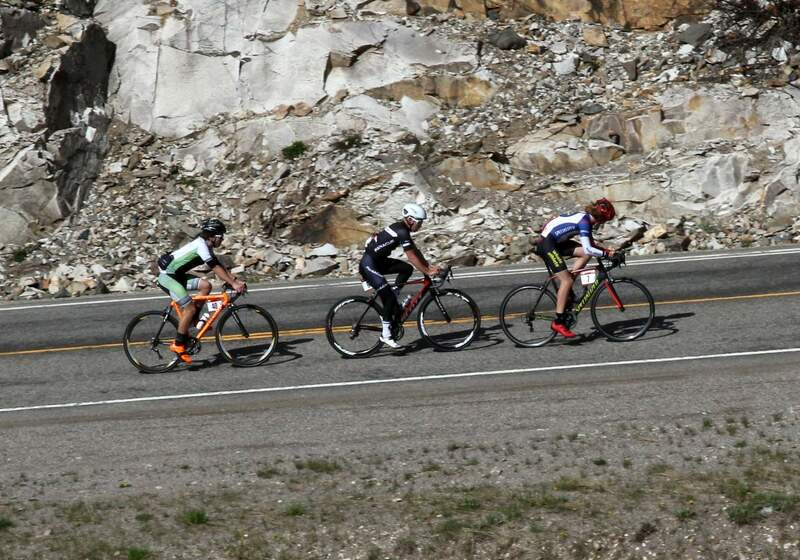 18-year-old Christopher Blevins took turns leading the peloton as they climbed Coal Bank Pass during the Iron Horse Bicycle Classic race Saturday morning. Christopher Blevins flew down Coal Bank Pass during the Iron Horse Bicycle Classic race on Saturday morning. Traffic backs up behind the peloton as they climbed toward Purgatory Resort during the Iron Horse Bicycle Classic race Saturday morning. 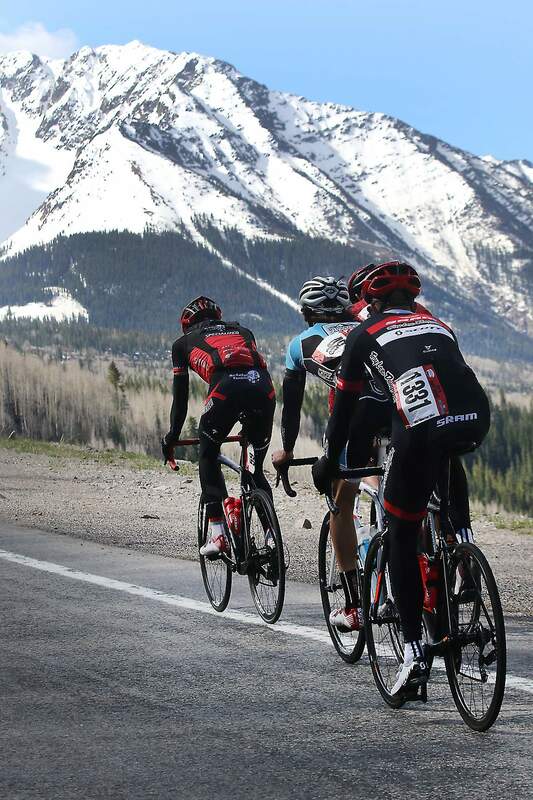 Men’s pro riders were relieved to start Molas Pass after getting through a tougher climb on Coal Bank pass. Fans lined up to cheer on the pro men’s racers during the Iron Horse Bicycle Classic race on Saturday morning. 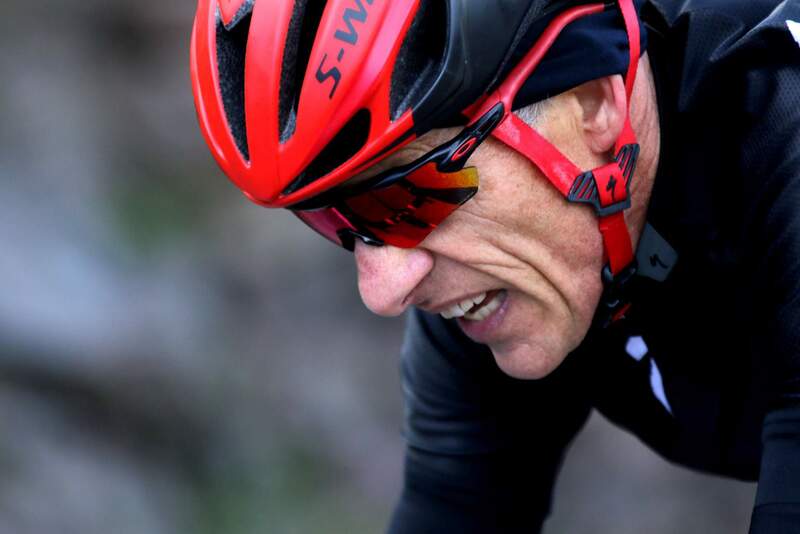 Ned Overend climbed Shalona Hill has he has since 1982 in the Iron Horse Bicycle Classic. 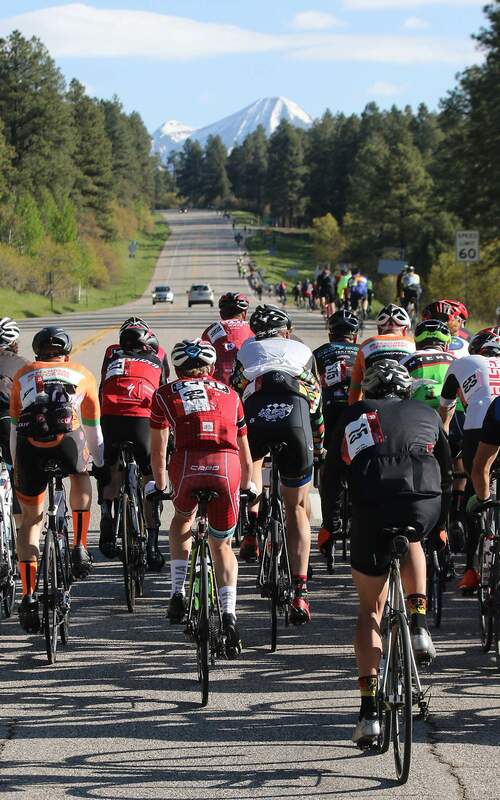 The peloton climbed toward Purgatory Resort with Engineer Mountain ahead during the Iron Horse Bicycle Classic race Saturday morning.